I printed the images, the sentiment is included in the set, onto the smooth side of a piece of Tim Holtz Distress Watercolor card stock and then used Distress Markers and a #2 and a "0" brush to watercolor it. I used a barely damp brush on this to insure that my printer ink wouldn't smear. But, I also printed this in gray and went over it several times with a kneadable eraser to pick up any excess ink. As usual, I let my piece air dry. And I came back and added my color in layers. It took me about 3 hours to paint this, including drying time. After everything was completely dry, I die cut the piece using a Simon Says Stamp Stitched Rectangle die and adhered it to my card base. 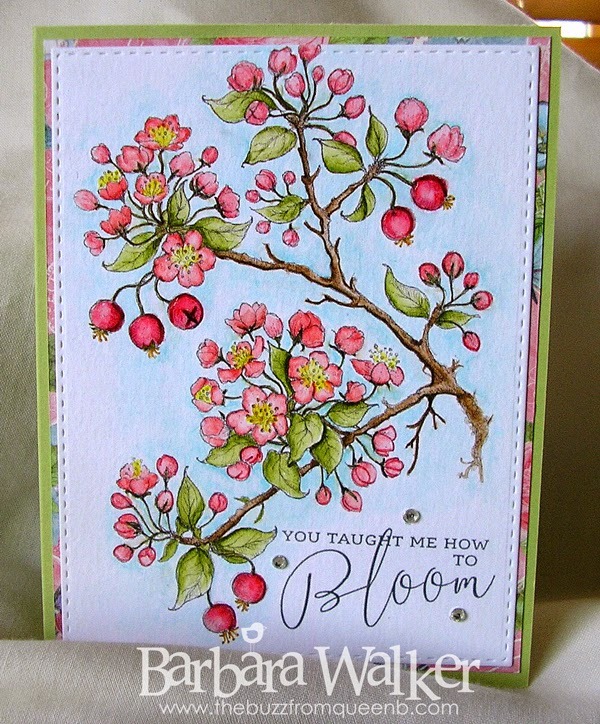 To finish off the card, I added rhinestones, went over the yellow centers with the Clear Wink of Stella glitter brush and added Glossy Accents to the berries/buds. I finished the inside, too. I used a digital sentiment that I picked up HERE. I just printed it onto a piece of card stock that I die cut. 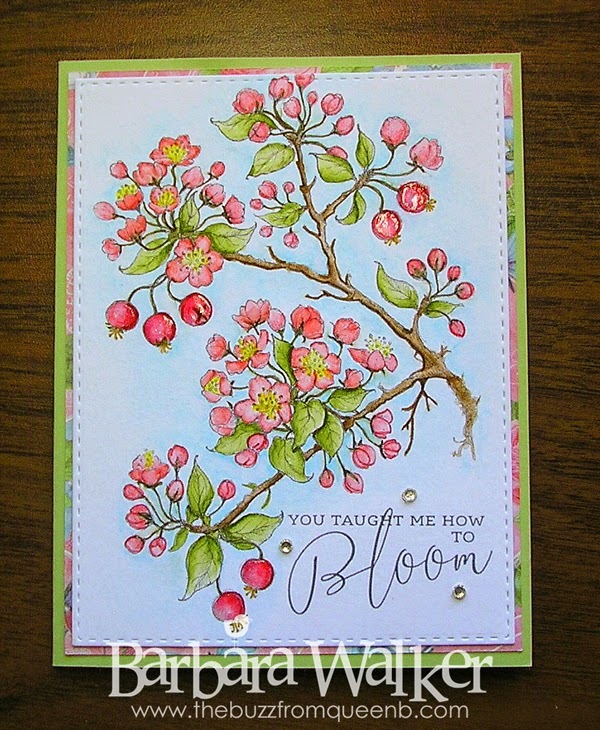 I stamped the "Happy Mother's Day" sentiment using Lawn Fawn's Black Licorice ink. I fussy cut the butterfly from a scrap of the patterned paper I used on the front of the card and added a flight trail with a black fine tip pen. And finally, I added a few stamped hearts. And that's all there was to it! Thanks for stopping by today. I appreciate the visit! Oh, Barb, this is gorgeous!! It was so worth all the time you spent waiting for it to dry and coloring...it's exquisite! Your mom is going to love it! So glad you got this digi!! Hugs! Precious!! love this greeting stamp you found for the inside too! 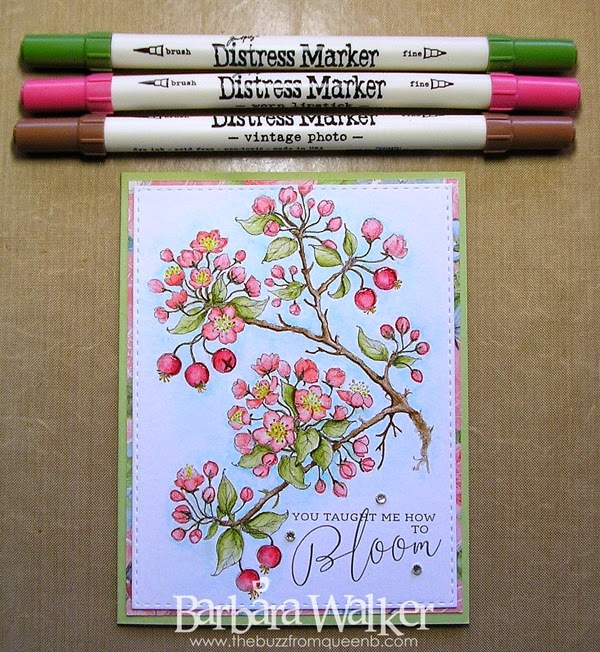 Such a lovely Digi stamp! :) pinning! Oh my goodness gracious, this is stunning, Barb! I am so awed by your talent for watercoloring. You have a wonderful touch for the technique. I agree with Darnell, this is something that warrants framing! The colors you chose are absolutely beautiful. So very well done! I agree with every word of all the above comments! What an appropriate and touching Mother's Day gift. Beautiful card! I love the image, and your coloring is wonderful. TFS.